Photoshop and The GIMP both offer stellar abilities to merge graphics together. Mastering this sort of splicing could prove advantageous for many reasons. I really enjoy bringing multiple images together to create something completely new. This week’s challenge involved creating a montage of two or more graphics, with text, to create an 8.5 x 11 project with a spiritual theme. I can rock this because I’m still on that General Conference high. 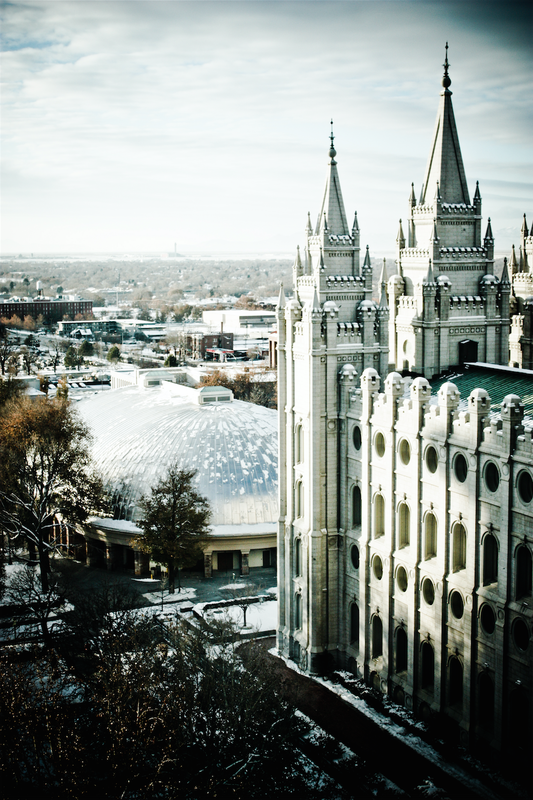 I chose my background: The Salt Lake Temple as seen from the Joseph Smith Memorial Building’s tenth floor. I love this view of Temple Square! This photo, taken several years ago in winter, is interesting. When I sat in Lightroom doing my whole workflow scene, I hit the wrong button in an attempt to just fix the color. I shot this picture through a tinted window so I needed to adjust the image to look natural. I ended up with this eerie color scheme that just “does it” for me. I quickly saved a copy and went back to my planned edits. Sorry, it was a pure accident so this is not information I have good details on from Lightroom. I opened my image file in Photoshop and then selected the crop tool. I set my size to be 8.5×11 inches and then slid my crop frame to where I wanted it. A hit of the check mark and my photo no longer fit to 4×6 multiples. I love The Christus statue. 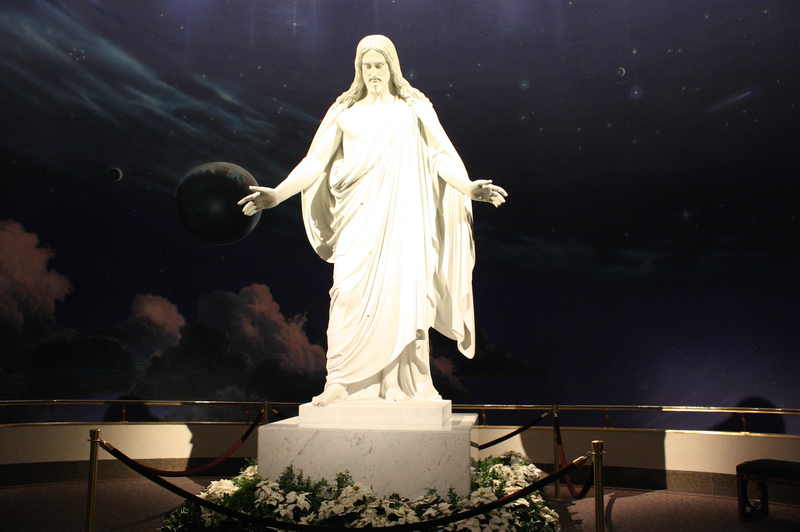 I can’t guess how much time I’ve sat at the feet of a replica of the statue in the Visitors’ Center at the DC Temple. I opened a photo I had of this statue in another Photoshop window. First, I chose Image Rotation – Flip Canvas Horizontally. After that, I used the Magnetic Lasso with a feather of 100 to select the statue. I switched to my Move Tool and dragged the selection to the window of the Temple. Using the layer window, I made sure my Christus layer was active. At the bottom of that window is the masking tool. Once a mask was active, I painted black to clear out the base and feet of the statue. With the photo zoomed in, I could also work on any dark pixels that made the move as well as soften the edges of the Christis for blending into the background for the montage effect. 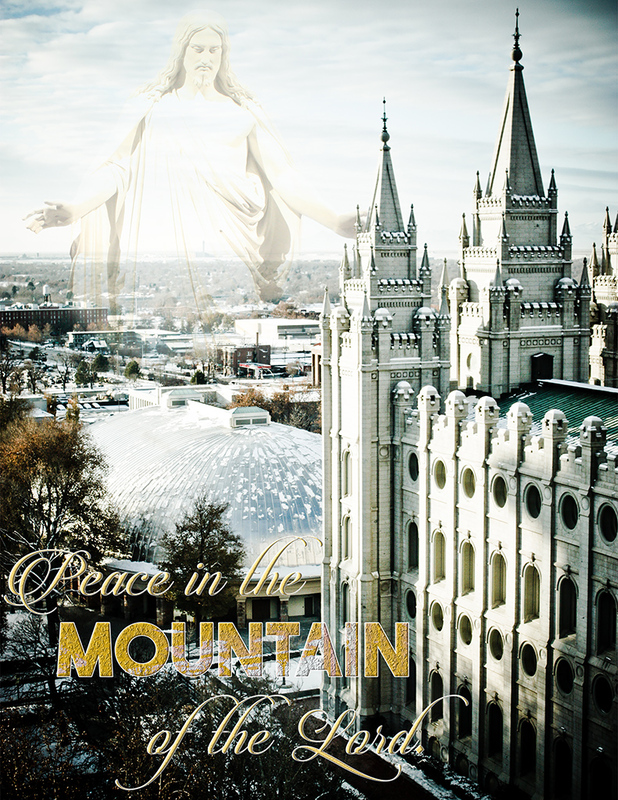 With a large amount of zoom in place, I was able to also mask the hand of the Christus to the spires of the Temple, making it appear as though His hand is behind the spires. Each layer has an opacity setting on the layer and I used the slider for the opacity until I felt it look sufficiently blended. I ended up with a 62% opacity in case anyone wants to know. Step 5: Cut The Background In Better. To make for a better merge, I selected the Christus using my magic tool and then swapped to the background layer. A quick copy and paste from that background layer into a new layer above the Christus and I could enable a cleaner bled between the Temple and Christus photos. I also knocked the opacity of this layer to about 40%. Fonts used: Candlescript Demo Version Regular and The Bold Font Bold. After selecting these fonts and putting the word layers in place, I used the layer effects to help give the lettering more interesting. I worked with a gold colour from the spires of the Temple as I worked through the effects. I wanted that shade for everything it symbolizes with the thought of the Temple. I arranged the word Temple first, as I wanted it to be my primary focus. From there I arranged the two phrases using my smart guides so the P in “Peace” and the d in “Lord” matched up with the first and last letters in “Mountain”. I locked the three layers to each other and moved them into place. Not only did I utilize the layer effects with things like bevel, emboss, and the like, for Mountain I changed the layer from a normal blend mode to “lighten”. To ensure that my two phrases had the same layer effects, I actually just did a straight copy layer effects from one to the other. The kerning for my The Bold Font looks off, but I do not have the software to accurately fix this problem. I did the best I could with the limited resources in Photoshop by placing my cursor between each letter and selecting the kerning box in the typography settings. From there I pressed the option and left or right arrow keys in order to adjust the kerning manually. It’s not a perfect or permanent solution, but it looks better. I really liked the sharpness of the original photo of the temple. You did a good job in blending the image of God above to the left, and not centering it. I thought the quote was very good, and I really liked how you made “Mountain” in a different color in order to have emphasis. I would only suggest to use a black mask behind the text so that it’s a little more clear to see. Good job! I thought about it and tried it, but I didn’t like how unbalanced everything looked with it. Hi, Lady Ozma! I really like the message you chose to share. I think the font you used worked really well in your montage. And the Christus statue looks well blended. Good job! Thanks! I worked quite hard on this project. As for the message – I very much needed it last week, so this was quite personal.